The Cold Stone Creamery (over in Market Place Plaza) is quite a lively place. They have about 20 standard flavors, and from those, create their ‘Signature Flavors’ It’s great to watch them make a speciality ice cream in front of your eyes. For instance, for the ‘Peanut Butter Perfection’ flavor, they took chocolate ice cream, and mixed in some Reese’s peanut butter cups. Plus, you have about 10-15 ‘mixers’ (nuts, Heath bars, chocolate chips, etc) to put on top or to mix in with your chosen flavor. The Ice Cream crew also breaks into song every so often, with special rendidtions of popular melodies. The lady that prepared my order said that when they first opened, the crew only sang two songs, but now they know about 10. Really a fun experience. Prices are about right as well. We went there last night, and enjoyed it immensely. Owing to the long line, the atmosphere was a little more raucous than I’d like, but that’ll calm down over time, I expect. The ice cream was wonderful. The Missus got Chocolate Devotion (four –four!– different chocolate sources ground into one), and I got the Cookie Doughn’t You Want Some. Yeah, silly name, but some of the best ice cream I’ve had. This store, like most other Cold Stone stores, will be out of business in less than two years, with the owners going broke or even bankrupt. Corporate greed with all their lies and kickbacks will be their downfall, just like has happened to hundreds of other Cold Stone franchisees. 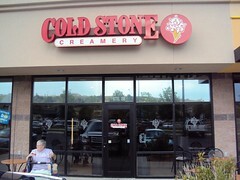 Check out http://www.bluemaumau.con and do a search for Cold Stone to get the whole story. Enjoy the ice cream while you can. It’s quite good. Unfortunately, Randy is correct and these owners will be bankrupt or on the edge of it within 18 months. If this is a new store chances are quite high they have invested more than could “earn” in the next 100 years of operating Cold Stone and continuing to throw money into a bottomless pit, hoping you can turn it around and salvage your investment, sanity, health and family and future.